Lake Barrington Shores is an active lifestyle community in Lake Barrington, Illinois. There are 1,317 attached homes, most of which feature first-floor master suites. There's a community clubhouse with a fitness center as well as a beautiful lake that offers residents opportunities for fishing and boating. The community is conveniently located in Lake Barrington, which is near highly-desirable Barrington in Lake County, a suburb of Chicago. The Lodge at The Shores, the community clubhouse, is hub of the community and a social center. For those looking to maintain a workout schedule, the onsite fitness center is available to residents 24 hours a day. There's also plenty of gathering space for community events as well as private gatherings. Residents can use an indoor pool year-round and an outdoor pool during the summer months. In additional to the clubhouse, there are also running trails, volleyball, tennis, and bocce ball courts are also within the community. Nearby Lake Barrington Shores Country Club offers an 18-hole golf course, perfect for golfers looking for a quick game close to home. Resident of Lake Barrington Shores can purchase a membership at a reduced rate. The community also has a marina on the shore of 96-acre Lake Barrington as well as boats for residents to use in addition to storage space for private craft. Attached homes range in size from about 933 to 4,600 square feet and offer one to four bedrooms, one to four bathrooms, and attached one or two-car garages. These floor plans are designed for efficiency and have been well-maintained. Most feature first floor master suites along with outdoor space. Some have finished or unfinished basements. Lake Barrington Shores is conveniently located in the city of Barrington. Daily shopping needs are easy with a Jewel-Osco, Trader Joe's, and numerous other retail shops and restaurants located just five miles away at the Bank One Plaza Shopping Center. Nearby Route 59 and Rand Road also offer an abundance of shopping and dining options. Commuters will also appreciate that the Barrington Metra Station is under five miles away. Barrington is just a little under forty miles away from Chicago making it easy, whether by rail or road, to enjoy this world-class city. 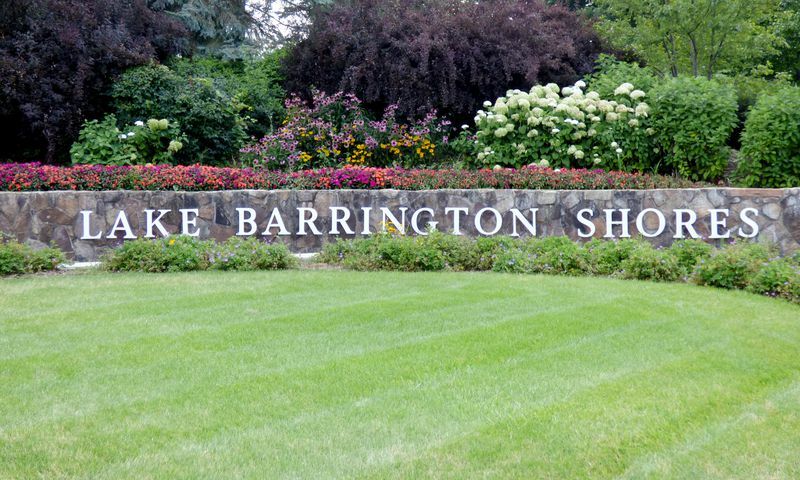 Homebuyers looking for a standout active-lifestyle community in the Barrington area will find a lot to love about Lake Barrington Shores. There are plenty of activities available in Lake Barrington Shores. Here is a sample of some of the clubs, activities and classes offered here. 55places.com is not affiliated with the developer(s) or homeowners association of Lake Barrington Shores. The information you submit is distributed to a 55places.com Partner Agent, who is a licensed real estate agent. The information regarding Lake Barrington Shores has not been verified or approved by the developer or homeowners association. Please verify all information prior to purchasing. 55places.com is not responsible for any errors regarding the information displayed on this website.